How do you say ‘Solidarity’ in Spanish? 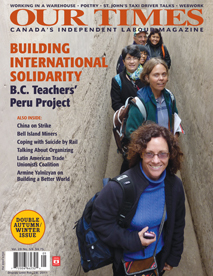 With a suitcase full of English-language lessons, I travelled to Peru this past summer with four other BC teachers, to find out. Read about our pedagogical adventures in the cover story of “Our Times” magazine, currently available in magazine stores across Canada.